When you think of Northern Virginia (NoVa), agriculture and farmland are most likely not the first thing to come to mind. In the most recent VALOR seminar, May 11-15, 2015, the fellows learned of agriculture’s presence in NoVa and even in the heart of Washington D.C. as they traveled by car, metro, and foot to dig deeper into agriculture at the nation’s capital. The fifth learning session began on the outskirts of Washington D.C. in Loudoun County with cattle and vineyards, as well as a presentation and discussion with Dennis Dimick of National Geographic Magazine regarding the future of food. As the day progressed and the sticky heat of mid-May began to set in, fellows were greeted at their evening stop with a beach-themed warehouse – the home of Endless Summer Harvest . Owner and President Mary Ellen Taylor immediately welcomed the group with lovely hospitality and a spirit of passion for her agribusiness. Endless Summer Harvest’s hydroponic greens and microgreens are valued by home cooks and professional chefs alike, as Mary Ellen sells at both farmers markets as well as direct market to local and regional restaurants. As the week progressed, so did the proximity to the nation’s capital. Scheduled meetings and discussions were interspersed with training on crucial conversations, and a candid look at history and leadership in Washington D.C. in relation to the shaping of a nation. The VALOR fellows also began preparation for their international learning experience in Vietnam, as they sampled traditional Vietnamese food and discussed Vietnamese culture with the staff at VietAroma in Vienna, Virginia. Members of VALOR also utilized their time in the Capital to seek out meetings with members of Congress and their staff, both as individuals and a group, to advocate for agriculture. 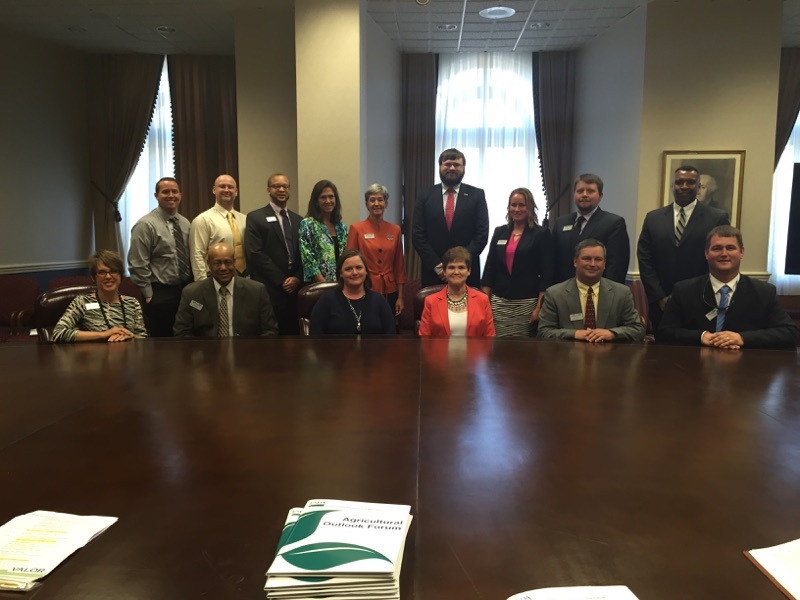 During scheduled time with the United States Department of Agriculture (USDA), VALOR members were pleasantly surprised with an impromptu visit from Deputy Secretary Krysta Harden. Her informal speech touched on the importance or rural America and the leadership skills developed there, as well as her background growing up on a Georgia peanut farm. She challenged VALOR to tell the story of agriculture, in our own communities and across social media channels; she voiced encouragement for woman leadership in agriculture from the farm to the fork. As the week ended VALOR closed the session with an open discussion at the Environmental Protection Agency (EPA) specifically covering water issues, both nationally and at the state level. The final stop was at the Arcadia Center for Sustainable Food and Agriculture’s Mobile Market . These markets on wheels “distribute local, sustainably produced food to underserved communities in the Washington D.C. area.” The mission of the mobile market stresses the importance of food for all, and accepts all forms of payments, including food assistance benefits. The market also offers assistance with food preparation, including cooking demos and free cookbooks. Time spent in and around Washington D.C. offered a valuable glimpse into large policy and national issues as well as startups and community endeavors. 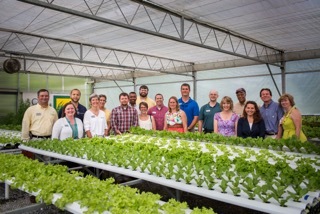 In July, VALOR fellows will head to the Southwest region of the state for a seminar of team building and collaboration in relation to agriculture. Don’t forget to follow along with us on your favorite social media site – Facebook, Instagram, or Twitter!